Alpe d’Huez Megavalanche and its famous Mass-Start at the top of the Pic Blanc glacier (3300m) are the « must do » for all the riders aroung the world since 1995. They are almost 2000 people to join the adventure every year, coming from 42 different nations to ride this crazy race, known as the longest downhill of the World, with its 20km and 2600m drop of pure adrenaline ! In 2002, Megavalanche gave birth to a shorter distance Marathon Downhill race with the Maxiavalanche series. The Maxiavalanche stages are using the same rules as the Mega, based on the Mass-Start® with a qualifying run on saturday, but has two race runs on sunday, on a shorter track, from 10 to 15km with 1000/1500m drop. This race concept ist easy to understand : let 100 to 300 crazy riders go from the top of the mountain, by groups of similar riding skills level, and first to the bottom takes the win ! Since 1995, these events haven’t stopped growing, seducing new riders thanks to its fun and its cool spirit. 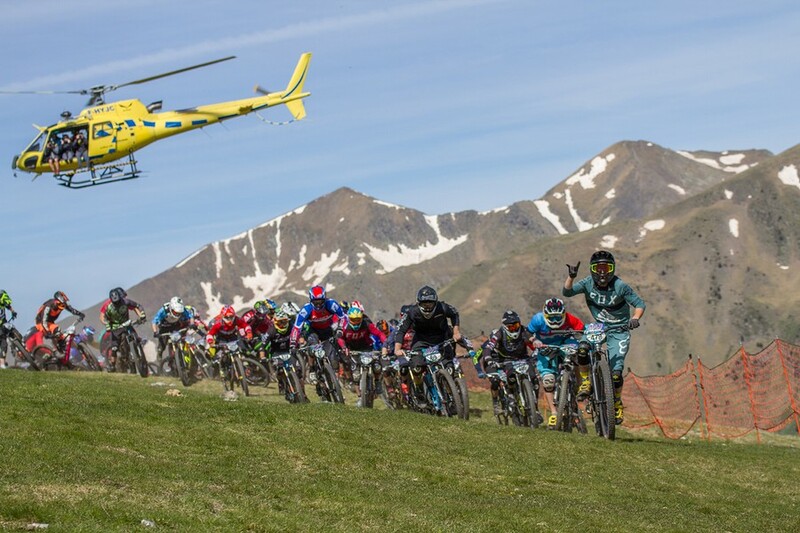 Indeed, a Mass-Start® is much more fun than a classic one-by-one enduro, the atmosphere before the start is much more tense but also friendlier, as everybody is equally scared ! The nice atmosphere keep going on after the finish line with an offered drink after the race and a nice aperitif in the evening gathering everybody ! The 100 best riders of each stage (the 100 first of the International Mega (on 350) and the 100 qualified in « Maxiavalanche Europe Cup) will score points for the European MASS START® Series in order to win the European Mass Start® Series Champion jersey and his ticket for the Megavalanche Reunion Island 2019 ! The Champions by category will also be rewarded with an official Champion jersey at the end of the Championship. The European Mass-Start® Series leader will be enhanced on each stage with a red n°1 frame plate, giving him/her the best position on the qualifying lines. Thanks to their qualifying system, Mega and Maxiavalanche allows every riders, pro as amateurs, to enjoy the race the way they want. Whether you are a really good pilot aiming the podium and willing to race hard to the end, or you just come here with your friends to ride for fun, enjoying the tracks and the race spirit, everybody finds what he likes ! If only the 100 best riders of the « Elite » group will score for the Championship, all the riders finishing the race will get a ranking in her/his group and category, and a chance to climb on a podium ! The race mode of the European MASS START® Series stages ensures the riders to ride as much as possible during their stay, and to enjoy the best riding spots of Europe ! Indeed, the resorts hosting these events are chosen for their quality of single-tracks network and bike-park slopes, and for their breathtaking scenery. Within the free-trials, official pratice, qualification, and race run(s), riders are welcome to use the lifts to discover the other trails offered by the bike-park as well. Megavalanche and Maxiavalanche really give the opportunity to ride a lot, enjoying as much downhills as you can and getting your shots of adrenaline for the year ! Launched in 2018, the MEGA KID gives the opportunity to the young champions from 7 to 14 years old to race on the easiest part of the « adult » race, on each European Mass-Start® Series stage ! A general ranking by age and gender category will reward the fastest and the most assiduous young riders of this championship ! Even if these races are mostly top-down, the Marathon Downhill tracks always have some short but tricky uphills, where most of the people won’t say no to a little help ! That’s why the Championship will also include an E-Bike category, with a specific start and its own ranking !